Saint Augustine: are we babies or sons of God? Augustine, even at the best of times, is a fairly morose character. He’s perhaps at his most sanguine when reflecting upon human nature, which is perhaps nowhere more shocking than in his condemnation of un-baptised babies. Seen positively, particularly in passages in the Confessions, Augustine likens man’s relation to God as like that of a baby to its mother’s breast – a relationship of intimacy and stark dependence as a result of helplessness. In bleaker passages, Augustine would concede that un-baptised infants would be punished eternally for their inherited sin “albeit ‘lightly.’”1 The emotive language and implications of Augustine’s condemnation does have profound symbolic importance to the way he viewed the Christian’s position. The warm image of a baby at the mother’s breast is intended to be directly applicable to all Christians’ position as “reliant on the sustaining love of God.”2 Just as a baby cannot speak, act or believe for themselves, so every Christian is reliant from first to last upon the divine action of God at the point of baptism and beyond. 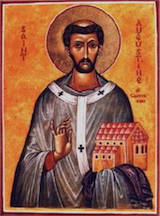 Baptism, for Augustine, launched a “lifelong process of convalescence,”3 rather than a one-off break with the past and a victorious life free from all hint of sin. Makes you want to sing for joy doesn’t it?! The Augustinian language of dislocation within the self was intended to be seen as a reflection of, and result of, “the dislocation in the primordial community between man and God.”8 For Augustine, Christ was the definition of what it means to be human, and the trinity was the lens through which we understand the nature of selfhood. In insisting that the human will could obtain perfection outside of the trinity and Christ’s mediation, Augustine’s claim that the Pelagian view of our position before God did no less than rupture the trinitarian and christological economy.